With the warm weather finally here, now is the perfect time to throw a BBQ party. While organizing a BBQ for all your closest friends and family can be a lot of fun, it can also be quite stressful. From sending out the invites to ensuring that there is enough food to go around, planning a successful BBQ takes a lot of time and effort. However, there are plenty of ways you can make things a little easier for yourself. Once you know how many people to expect, the first thing you should do is check whether you have enough seating. If you don’t have enough seats for everyone, don’t panic. You have options. If there are a lot of people coming to your BBQ, it’s unlikely that you will be able to provide enough seats for everyone. However, it’s a good idea to have an outdoor table that can be used for placing the food. For most people, a good BBQ includes lots of delicious meats, like ribs, chicken, hot dogs, and burgers. However, while it’s a good idea to stock plenty of meats for the party, it’s also important to have some vegetarian alternatives on offer. Grilled vegetables are delicious and allow your guests to enjoy grilled cooking. Many vegetarians also eat veggie sausages and burgers, so you could consider getting some of these as well. To cut down on costs, make the sides and salads yourself. These are generally easy to prepare and won't require a large chunk of time. Instead of buying sides like potato salad and coleslaw, make them yourself. Not only will homemade sides be healthier than shop bought ones, they will also be less expensive. Things like couscous, tomato salad, potato salad, coleslaw, and pasta salad are all easy to make. If, however, you don’t have the time to make all that, you could always ask people to bring a dish each. Sometimes BBQs can take a while to cook the food, so it’s a good idea to have a few nibbles on hand for your guests to snack on. Things like hummus and carrot sticks, pretzels, potato chips and dips, and tzatziki and cucumber, are all ideal for warding off hunger. Organizing a BBQ can be stressful, so try to make things as easy for yourself as possible. You're hosting a backyard barbecue not a formal dinner party. Instead of leaving yourself with plate after plate to wash, use paper plates, plastic cutlery, and plastic cups. That way once the BBQ is over, all you have to do is bag up the trash. A barbecue is intended to casual and fun, whether you are the host or a guest. 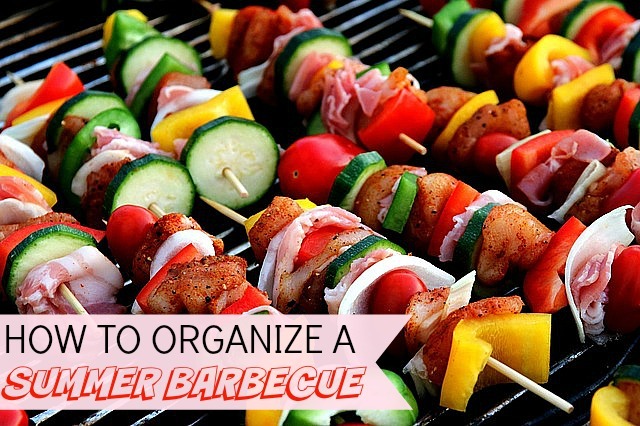 Organizing a big BBQ can be stressful, however, if you follow these tips you can make it a lot less stressful for yourself.